A more diminutive variety of the jade plant, Crassula ovata (Hobbit Jade) is a succulent plant that grows up to three feet tall. The stubby, 2-inch green leaves are tubular with curled edges and bright red tips, leading some people to compare the plant to sea coral. As with other succulents, the leaves are fleshy and filled with water, and larger plants have woody stems. The small, star-shaped flowers are white or pale pink, but they only bloom under ideal conditions. 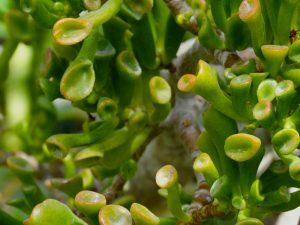 The Hobbit Jade is slow-growing but can spread up to two feet across at maturity. It will grow indoors or out, and it needs infrequent repotting as a houseplant since it likes having roots that are close together. Plant in well-drained soil with compost added, and include perlite for drainage. A layer of pebbles and sand at the bottom will help with drainage and prevent rot from forming. Outside, plant Hobbit Jade in an area that will get at least four hours of direct sunlight each day. It can grow in indirect light, but the color won’t be as vibrant. As a houseplant, place the pot near a window that gets a lot of light. Since jade is a desert plant, fertilization once a year is plenty, and diluted liquid fertilizer is the best choice. Don’t fertilize during the winter, though, since that’s a period of dormancy for the Hobbit Jade. Mealybugs, spider mites and scale will attack jade plants, but you can easily get rid of them in the early stages of an infestation. First, remove the pests with a cotton ball dipped in alcohol. Then swab the leaves with insecticidal soap, but don’t spray it directly on the plant. The slow growth of the Hobbit Jade makes it a good choice for terrariums. It’s also an excellent bonsai plant and a hard-to-kill houseplant. Outdoors, it creates an attractive, non-invasive ground cover. Outdoor potted jade plants should be brought inside before the first winter frost. Overwatering will cause the Hobbit Jade to rot at the base and perish. Allow it to dry out before watering again since the plant is better off with too little water than too much. If you find rot at the base, you can still make cuttings from the leaves for propagation. The Hobbit Jade is transplanted by using stem cuttings. The flowers produce seed, but jade plants only bloom under ideal conditions. Allow a cutting to dry out and form a film over the raw edge before transplanting. Then put it into a well-drained soil mixture. In the garden, jade plants will spread by dropping leaves that end up rooting in the nearby soil. In order for this plant to bloom, it needs well-drained soil and has to experience cold temperatures in the autumn. Indoor potted Hobbit Jade can be exposed to fall temperatures by putting it outside on a porch or patio for a few weeks. As the days grow shorter and cooler, the plant’s biological clock will tell it to bloom. The stems of Hobbit Jade can become leggy, and pruning them in the fall will help the plant retain a rounded shape. In the spring, cutting away some of the new growth will help the main stem grow stronger and keep the plant more compact. 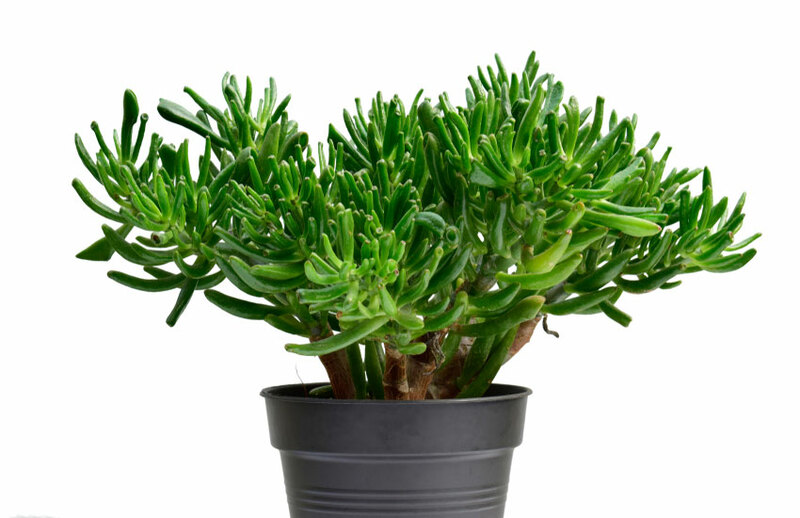 The jade plant originated on the African continent, in South Africa and Mozambique. The Hobbit Jade is a garden cultivar that was introduced in the 1970s.